Smart Lighting is the premiere application for a smart and connected city. The NearSky™ platform enables solutions such as small cell deployments, IoT communication infrastructure, parking and traffic tracking, environmental monitoring and other public safety solutions to any smart city deployment. 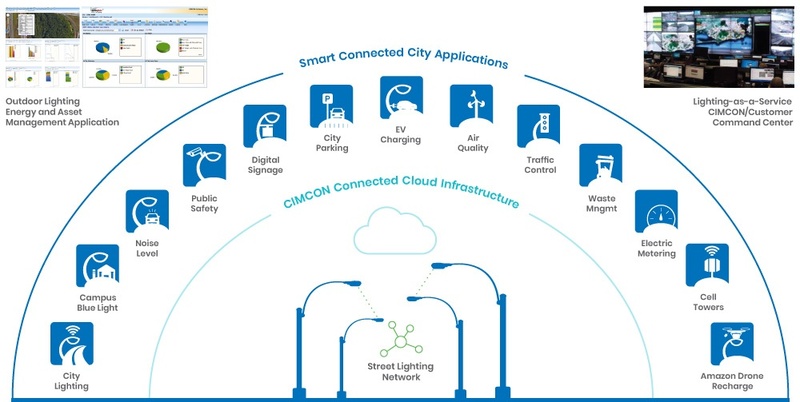 CIMCON’s NearSky™ 360 accelerates a city’s evolution to becoming “smart” by providing a sturdy, scalable backbone for the acquisition of city data from sensors, controls and devices on or near any streetlight pole. A simple “plug and play” installation enables NearSky 360 to easily capture, aggregate and communicate sensor data from a wide range of devices through various smart city and AMI networks. Illuminate your streets while also conserving energy. While cities switching to LED lighting save 50-60% on costs, CIMCON allows another 10-20% of savings which leads to a significant ROI within just 2-3 years. With the ever-increasing connectedness of college students, it is now possible for a simple shake of their phone to activate nearby CIMCON lighting controls to flash and reach out to security in an emergency situation. Since districts within cities have various noise regulations, CIMCON’s NearSky platform and lighting control network can enable the use of external microphones to determine noise levels and identify when regulations are being exceeded. For example, construction sites in cities may request to start earlier in the morning provided they maintain a low noise level. If residents complain about noises, this feature allows city officials to detect whether or not the regulated noise level was indeed exceeded. With the power of digital cameras, our NearSky platform can process video streams, extract information, and then use the lighting control network to transmit priority information to the designated security center. Digital signs placed on the poles are available to display numerous messages, including banner advertisements, nearby attractions for pedestrians, and emergency/city information updates (i.e. weather/amber alert warnings). Equipped with CIMCON’s controllers, streetlights become a prime location for monitoring the availability of parking spaces. Pole attached devices can detect when a space is occupied or unoccupied, and this information can be sent over the lighting control network to a central location which will then update the number of parking spaces available as shown on digital signage and city resident smartphone applications. As electricity is used to power a streetlight, it can also be used to power electric vehicle chargers. 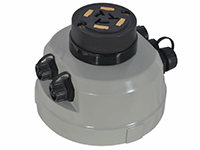 CIMCON’s power metering nodes, based on our proven lighting control node technology, enables the metering of electrical usage, and the lighting network can transmit this power consumption data to electric utility. With the NearSky platform’s power processing and communications capabilities, air quality sensors can be powered to monitor levels of emissions from vehicles, ozone or small particulate matter in the air. This information can then be converted to measured data used to notify residents of the neighborhood air quality. In monitoring the number of vehicles on the road, it is possible to adjust the phase of the traffic signal to allow more vehicles to pass on green and improve traffic flow. This is also linked to air quality, since a car sitting idly at a red light in traffic is emitting toxic gases. If the air quality in the area then falls below EPA regulations, an improved traffic flow may be required to move traffic quickly through the area, thus reducing the level of toxic gases in the air. 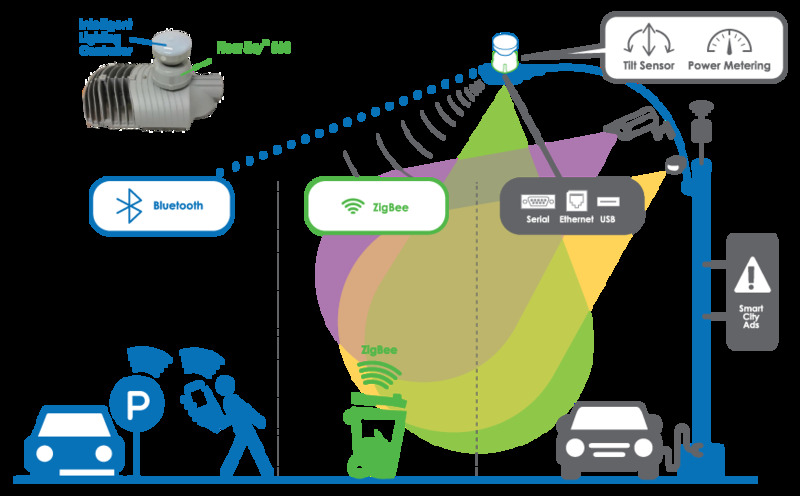 Using small ultrasonic sensors which can measure the volume of a trash container, it is possible to optimize trash pickup by more efficiently routing garbage trucks throughout the city to pick up only trash from the full containers. The ability to meter the amount of electricity consumed by lights is standard in all of CIMCON lighting’s controls. It is also used to meter EV charging and small cell tower energy consumption. With smart poles, small cell communication capabilities can be inserted inside a light pole and metered by CIMCON’s electric metering node. With 24/7 electricity, CIMCON’s controllers are an ideal location for Amazon to recharge drones in between drop offs.